You'll find our food better than typical cafe's and restaurants. Want to know why our food tastes so great? The difference comes by buying the highest quality meats, vegetables and other ingredients, and preparing them from scratch daily, just like your grandma did. To keep everything as fresh as possible we prepare small amounts of each recipe over and over throughout the day, so the last customer has a meal just as good as the first customer. Two eggs any style with your choice of hash browns, grits, breakfast potatoes and your choice of toast, biscuit & gravy, english muffin, two flour tortillas or two pancakes. One egg any style with your choice of hash browns, country potatoes, and your choice of toast or biscuits & gravy. Two biscuits, two freshly breaded chicken strips, two eggs* cooked your way, hash browns or home fries, gravy and shredded cheddar cheese. Scrambled eggs, two homemade buttermilk biscuits with country creamy gravy, grilled sausage and ham, topped with melted cheddar cheese and served with hash browns or country potatoes. Two eggs scrambled with chopped jalapeno, salsa and pepper jack cheese. Served with a breakfast potato and bread. Two eggs, chorizo, hash browns, monterey jack cheese, onions, bell pepper, jalapeno and tomato. Served with a breakfast potato and bread. Filled with cheddar cheese, ham, green onions, two scrambled eggs, served with sour cream, salsa and a breakfast potato. Two large fluffy biscuits split open, then topped with scrambled eggs and smothered in sausage gravy. Two eggs, two bacon strips, one 2oz sausage and pancakes. Two eggs, two bacon strips, one 2oz sausage, two pieces of toast and choice of potato. Two eggs, two bacon strips, one 2oz sausage, and 4 pieces of french toast. Served with your choice of hash browns, grits or breakfast potatoes. Your choice of toast, biscuit & gravy, english muffin, two flour tortillas or two pancakes. Served with your choice of hash browns or breakfast potatoes. Your choice of toast or biscuits & gravy. Two eggs*, ham, bacon, sausage and hash browns or breakfast potatoes. Three pancakes, three eggs, three bacon strips with your choice of hash browns or breakfast potatoes. Sausage, bacon, ham and monterey jack cheese. Served with your choice of hash browns or breakfast potatoes. Your choice of toast or biscuit & gravy or english muffin, two flour tortillas or two pancakes. Three eggs and three ingredients. Served with your choice of hash browns or breakfast potatoes. Your choice of toast or biscuit & gravy or english muffin, two flour tortillas or two pancakes. Bacon, ham, tomatoes and monterey jack cheese. Served with your choice of hash browns or breakfast potatoes. Your choice of toast or biscuit & gravy or english muffin, two flour tortillas or two pancakes. Your choice of any or all veggies with cheddar cheese. Served with your choice of hash browns or breakfast potatoes. Your choice of toast or biscuit & gravy or english muffin, two flour tortillas or two pancakes. Ham and cheddar cheese. Served with your choice of hash browns or breakfast potatoes. Your choice of toast or biscuit & gravy or english muffin, two flour tortillas or two pancakes. Bell peppers, ham, onions and cheddar cheese. Served with your choice of hash browns or breakfast potatoes. Your choice of toast or biscuit & gravy or english muffin, two flour tortillas or two pancakes. Bacon, spinach, mushrooms and monterey jack cheese. Served with your choice of hash browns or breakfast potatoes. Your choice of toast or biscuit & gravy or english muffin, two flour tortillas or two pancakes. Jalapenos, onions and monterey jack cheese. Served with your choice of hash browns or breakfast potatoes. Your choice of toast or biscuit & gravy or english muffin, two flour tortillas or two pancakes. Everything but the kitchen sink. Served with your choice of hash browns or breakfast potatoes. Your choice of toast or biscuit & gravy or english muffin, two flour tortillas or two pancakes. Made from scratch. Served with margarine and syrup. Sugar-free available upon request. Add hash browns or home fries for 2.25. $3.65 or add two pieces of bacon $5.29. Made from scratch. Served with margarine and syrup. Sugar-free available upon request. Add hash browns or home fries for 2.25. BBQ sauce, lettuce, tomato and red onion. 1/3 pound $6.49, or 1/2 pound $9.49. Mustard, lettuce, tomato, red onion and pickle. 1/3 pound $5.49 or 1/2 pound $8.49. Grilled onions, mustard, lettuce, tomato, red onion and pickle. 1/3 pound $5.49 or 1/2 pound $8.49. Mayo, lettuce, tomato and red onion. 1/3 pound $6.49 or 1/2 pound $9.49. Mayo, lettuce, tomato and red onion. 1/3 pound $6.99 or 1/2 pound $9.99. Jalapeno peppers, mayo, lettuce, tomato and red onion. 1/3 pound $6.49 or 1/2 pound $9.49. Burgers, Dinners, Sandwiches, Salads & More. Our most popular item. Served with your choice of brown or country gravy. Order full or half portion. Comes with your choice of two sides. Made fresh daily just like Jimmy’s grandma used to make. 8 oz portion. Served with your choice of two sides. 8 ounces and served with grilled onions. Comes with your choice of two sides. Hand breaded chicken breast, fried golden. Served with choice of brown or country gravy. Comes with your choice of two sides. Comes with your choice of two sides. Thick sliced bone-in ham, grilled or blackened. Comes with your choice of two sides. 8 oz sirloin cooked your way. Comes with your choice of two sides. 6 buffalo wings. Comes with your choice of two sides. Hand breaded and fried to perfection. Comes with your choice of two sides. Slow roasted roast beef. Comes with your choice of two sides. 3 slow-smoked ribs. Comes with your choice of two sides. 6 rib dinner. Comes with your choice of two sides. Available Wednesdays & Thursdays only. Stuffed with BBQ. Comes with your choice of two sides. Catfish entrees come with homemade cucumber salad, homemade tartar sauce, lemon, your choice of two sides and a dinner roll. Small portion comes with 5 strips $9.99 or Large portion 8 strips for $11.99. For those who like a little extra spice. Catfish entrees come with homemade cucumber salad, homemade tartar sauce, lemon, your choice of two sides and a dinner roll. Crisp iceberg wedges topped with cheddar, crumbled bacon, diced tomatoes and cucumbe. Served with crackers and your choice of dressing. Your choice of grilled or crispy chicken, sliced and served over a bed of lettuce, cheddar and mozzarella cheese, with tomatoes and a boiled egg. Served with crackers and your choice of dressing. Ham, bacon, cheddar and mozzarella cheeses, tomato, red onions and a boiled egg. Served with crackers and your choice of dressing. Lettuce, cheese and tomato. Served with crackers and your choice of dressing. 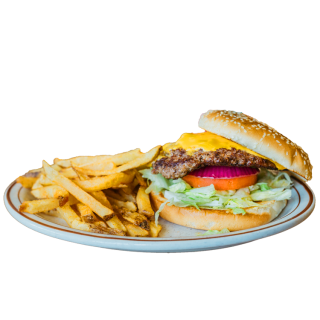 Add fresh cut fries or hand-breaded onion rings $2.99. All New or All American. Add fresh cut fries or hand-breaded onion rings $2.99. Mashed potatoes only. Add fresh cut fries or hand-breaded onion rings $2.99. Sweet treats for fine folks. So good, they’re part of our brand name. Your choice of apple, apricot, peach or cherry. Made from scratch daily. They’re legendary! Made from scratch daily. Selection varies. Ask your waitperson for daily selection. Click a tab below to toggle between categories. Served with margarine & syrup. One pancake plus choice of piece of bacon or sausage. With hash browns or home fries and toast. With bacon or sausage, hashbrowns or homefries and toast. With choice of one side. Try one of our fan favorites today! A whopping 1/2lb of fresh, never frozen beef, hand pressed. They’re half-price every Tuesday and Thursday. Several to choose from or build your own. Our most popular menu item. It’s so good, it’s legendary. 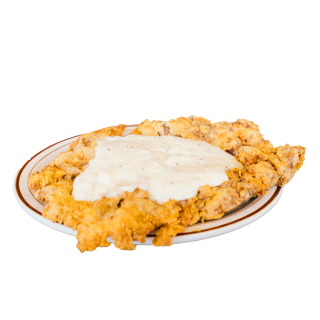 Hand-breaded and topped with our country gravy. You’ll need a nap later, but it’s so worth it! 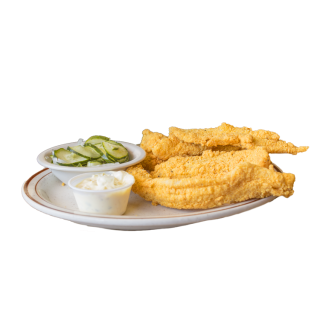 Our fresh caught, hand-breaded, made to order catfish is so light and fluffy and served with homemade tartar sauce and pickles and onions and your choice of side.